From time to time they will also email out bonus codes. 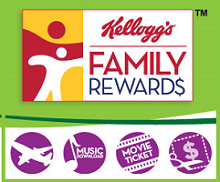 You can also purchase specially marked Kellogg’s Family Rewards products like cereal, crackers, and snacks (participating products and their point values) and enter the 16 digit code found inside the item to earn points. You can redeem your rewards to get Coupons, Discounts, Gift Cards, Sweepstakes & Instant Wins, Books, Music, Magazines, Electronics, Toys & Games, Housewares/Kitchen and Apparel & Gear.